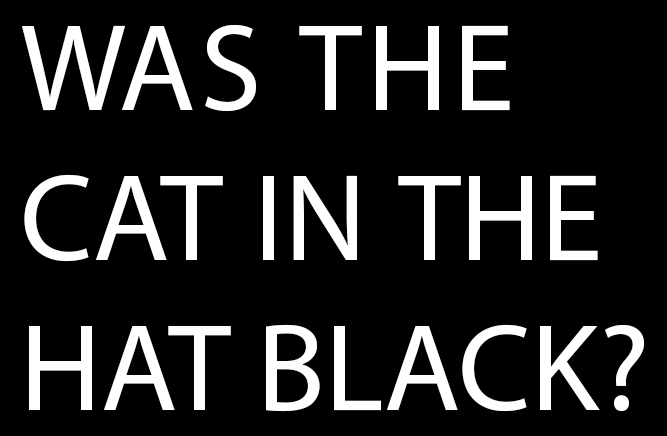 And now,… presenting a 45-minute illustrated lecture of my Was the Cat in the Hat Black? : The Hidden Racism of Children’s Literature and the Need for Diverse Books. Indeed, here are two versions, one in English and one in Spanish (which is also delivered via sign language). Both versions were recorded in the past couple of months — the English-language one in Mountain View in July 2017, and the Spanish-language one in Santiago in August 2017. The English-language version comes courtesy of Talks at Google. Thanks to (ex-Googler) Tyler Shores for making the Google connection, and to David Barry and everyone at Google for their hospitality! I had a great visit to the Mountain View campus this past July. La versión en español es cortesía de Chile’s Ministerio de Educación. Mi discurso comienza a los 34 minutos del video. Esta versión dura unos 10 minutos más: estoy hablando más lentamente para ayudar al traductor a mantener el ritmo. Muchismas gracias a Mónica Bombal Molina por la invitación, y a Mónica, Andrea Casals, y Catalina Landerretche por su hospitalitad. ¡Me gustó mucho mi visita a Santiago! “7 Questions We Should Ask About Children’s Literature,” Oxford University Press Blog (19 Sept. 2017). There’s also a brief, related post on this blog. Racism & Seuss: It’s not a bug. It’s a feature. (A Twitter Essay) (12 Aug. 2017). A condensed version of an argument also made in the book. Was the Cat in the Hat Black? — cover reveal (19 Dec. 2016). The debut of Lucas Heinrich’s superb cover! White nationalism is on the rise in the US and nativism is in the ascendant across the globe. What role can literature for children play in teaching the next generation to be more empathetic, to respect difference, and to reject hatred? How do we find children’s books that promote these values? And what do we do with classics that offend? … and 6 more questions. Oxford UP asked me to write the post to help promote Was the Cat in the Hat Black? My own aspiration was also to write something that could be useful in evaluating books for young readers. Here’s hoping that the questions can be of some help to educators, parents, publishers, and all who are involved with children’s literature. 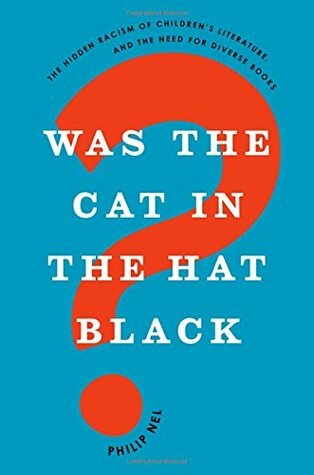 REMINDER: Goodreads Giveaway of Was the Cat in the Hat Black? Giveaway details via the link below (and via the links in this sentence). 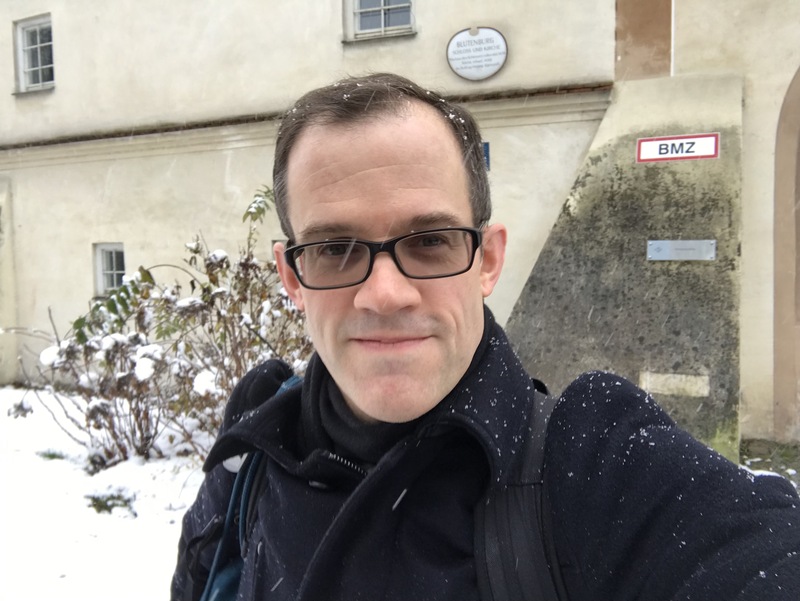 If you’d like to learn more, Oxford University Press has created three short videos (featuring me) addressing some of the subjects in the book. Rudine Sims Bishop’s work is foundational (I mention Professor Bishop in the second video, above). My book builds upon the work of lots of smart scholars, including Bishop, Michelle Martin, Robin Bernstein, Kate Capshaw, and many others. Was the Cat in the Hat Black? wouldn’t be possible without their groundbreaking work. 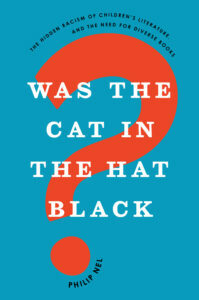 Free Book: Goodreads Giveaway of Was the Cat in the Hat Black? Greetings, people who read books! 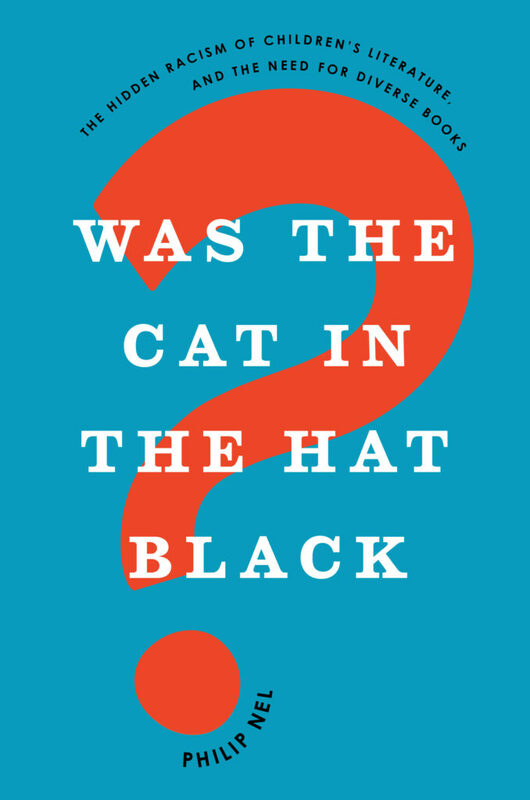 Thanks to Oxford University Press, there is — this month — a Goodreads giveaway of my new book, Was the Cat in the Hat Black? : The Hidden Racism of Children’s Literature and the Need for Diverse Books. 10 copies will be given away. Giveaway details via the link below (and via the links in this sentence). Again. And Again. And… ENOUGH! I can’t watch the latest videos of police murdering black men. I feel that I should watch them, to bear witness. But… the depressing regularity of these videos threatens to engulf me in despair. So, I am not watching the murders of Alton Sterling and Philando Castile. Instead, I will write a few words — expressing sentiments I’ve shared before and that others have expressed more eloquently. 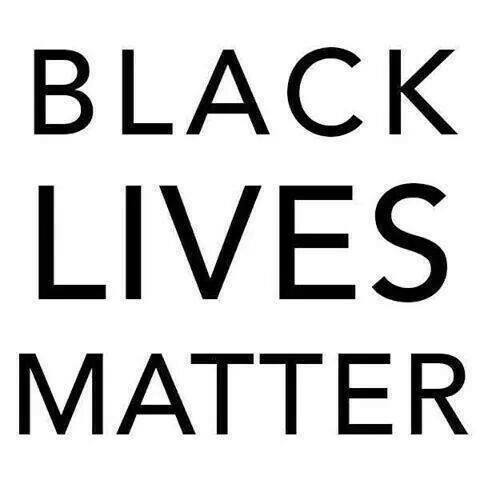 Let’s start with three words: black lives matter. If you are tempted to respond “all lives matter,” please don’t. Of course all lives matter. But all lives are not equally at risk. Black lives are much more susceptible to being cut short — by police, by stand-your-ground enthusiasts, by others. 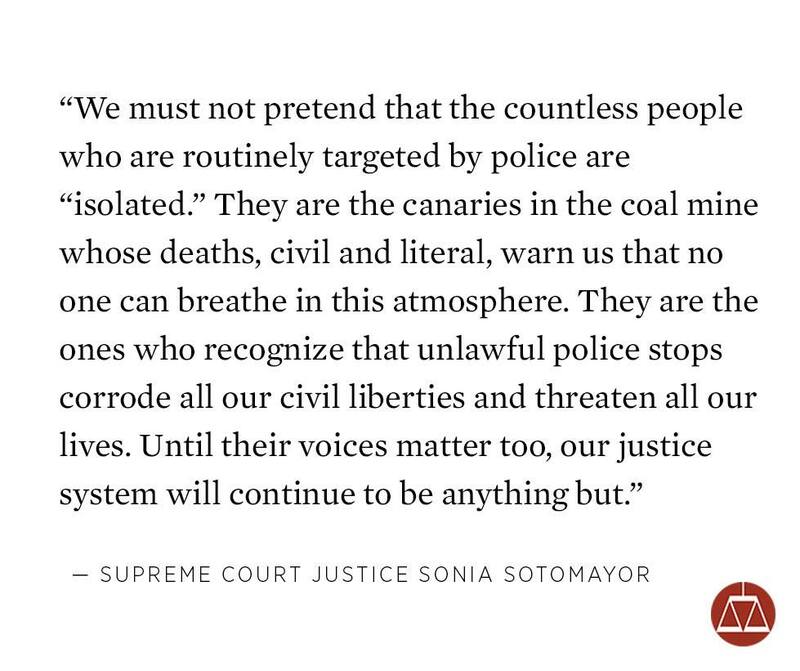 And that’s why we need to say black lives matter, but we don’t need to say all lives matter. If I see red flashing lights in my rear view mirror, and a member of the police signaling me to pull over, I do not fear for my life. I am calm because I am white. When a person of color sees those red flashing lights, his or her experience tends to be quite different. Hundreds of years of brutalization at the hands of the law can make a non-white person view representatives of that law more warily. 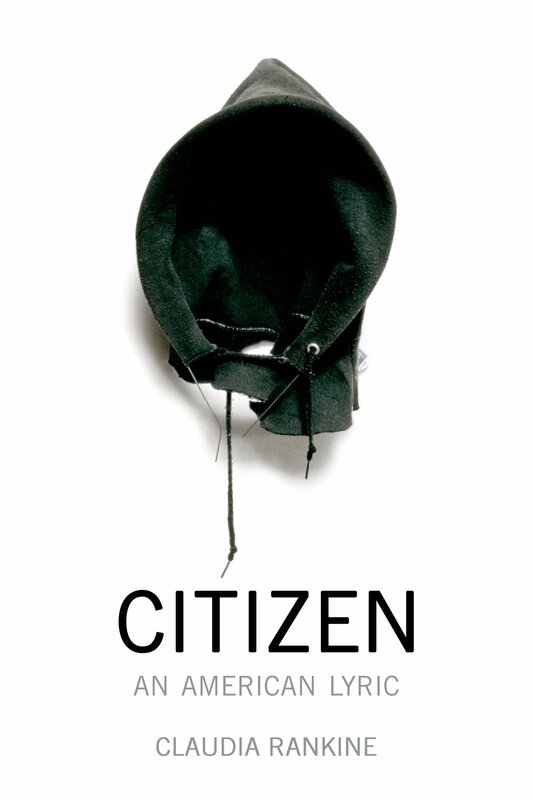 If you haven’t read her Citizen or watched Williams’ speech, please take the time to do so. While I do not believe that my individual words will make a difference, I do believe that if enough people speak up, we can change the system, move it closer to justice. I also believe that, as the primary beneficiaries of white supremacy, it is white people’s responsibility to end white supremacy. Stay with me here, fellow white people, and I’ll explain what I mean. As a white person, I am a direct beneficiary of American racism. Every day. Let’s start with the fact that I have never been the target of racism. I’ve never been asked why I speak so “white.” Nor have I ever been asked to speak for all white people. While shopping, I’ve never been tailed by a store detective. My job application has never been passed over because my name looked “ethnic.” And red flashing lights in my rear view mirror do not make me mortally afraid. I could write a much longer list, but my point is that the unearned privileges of whiteness accrue over time. For non-white people, the penalties and their attendant psychic stresses also accrue over time. In other words, white supremacy not only grants me advantages; it actively penalizes non-whites. Every day. I say this because a lot of white people fail to realize that you don’t have to actively support white supremacy in order to be a beneficiary of white supremacy. All white Americans are beneficiaries of white supremacy, whether they want to be or not. Our privilege conveniently conceals itself from us, and so we don’t notice our unearned advantages. As a result, we also don’t notice that those privileges are built on the oppression of others. Start there. Start with recognizing your complicity. And then act. Ta-Nehisi Coates’ “The Case for Reparations” (The Atlantic, 21 May 2014). Long and well worth your while. Sally Kohn, “This is what white people can do to support #BlackLivesMatter” (Washington Post, 6 Aug. 2015). Here’s some news I’ve been itching to share: Oxford University Press will publish my next book, Was the Cat in the Hat Black? : The Hidden Racism of Children’s Literature, and Why We Need Diverse Books. Also, this coming Monday, I will be turning in (to Oxford) the complete manuscript of the book. Though it’s too early to confirm a publication date, I’m hoping it will be out by late 2016. 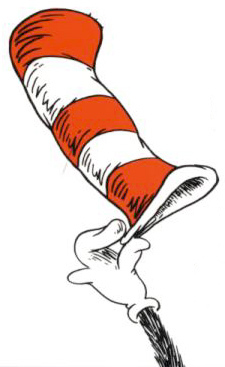 No, the entire book is not about the Cat in the Hat, though Seuss’s famous feline features prominently in one chapter. 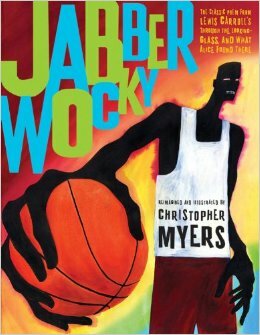 The book is about different manifestations of structural racism in the world of children’s books: the subtle persistence of racial caricature, how anti-racist revisionism sustains racist ideas, invisibility as a form of racism, whitewashing young adult book covers, and institutional discrimination within the publishing industry. 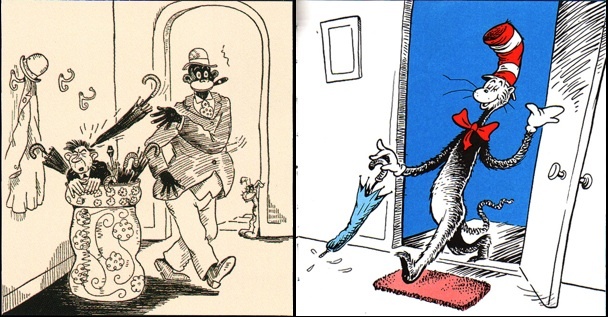 The book takes its title from the Seuss chapter (which looks at, among other things, the influence of blackface minstrelsy on the Cat) because several of his works illustrate how racism hides openly — indeed, thrives — in popular culture for young people. Since the hidden racism of children’s literature is my central theme, a Cat-in-the-Hat riff on Shelley Fisher Fishkin’s Was Huck Black? became the title. Fifty years after the Civil Rights Movement, we have a new civil rights crusade — the Black Lives Matter movement, inspired by the 2013 acquittal of Trayvon Martin’s murderer, and galvanized by the 2014 Ferguson protests. 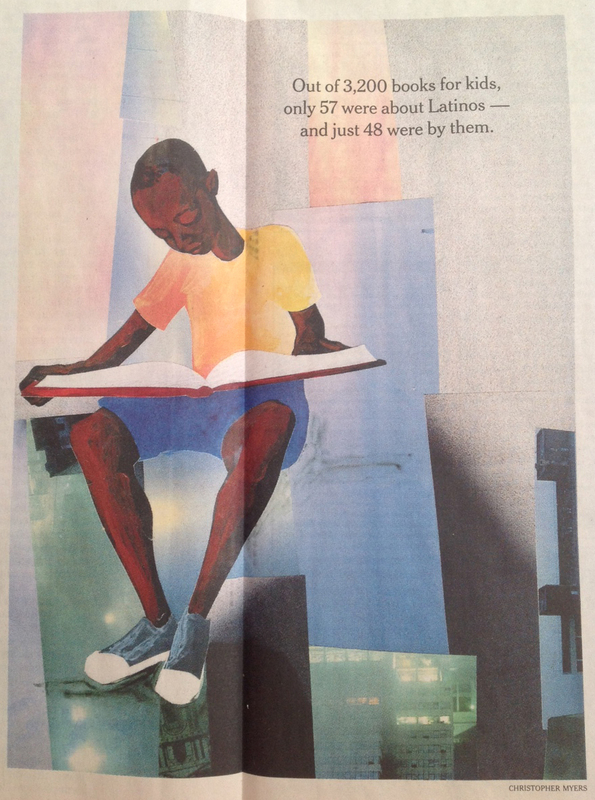 Fifty years after Nancy Larrick’s famous “All-White World of Children’s Books” article (1965) asked where were the people of color in literature for young readers, the We Need Diverse Books campaign is asking the same questions. These two phenomena are related. America is again entering a period of civil rights activism because racism is resilient, sneaky, and endlessly adaptable. In other words, racism endures because racism is structural: it’s embedded in culture, and in institutions. One of the places that racism hides — and the best place to oppose it — is books for young people. 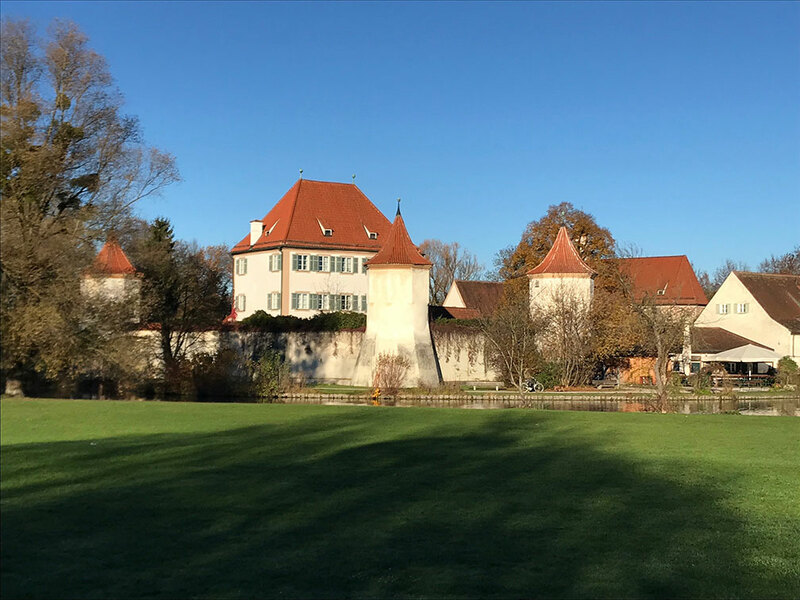 Finishing this book (on top of teaching, writing other things, grading, editing, and everything else) is one reason this blog has recently been a little quieter than usual. As regular or even irregular readers of Nine Kinds of Pie have likely already guessed, fragments of this work-in-progress have appeared here. My earliest (and admittedly flawed) thinking on what developed into Chapter Two started as “Can Censoring a Children’s Book Remove Its Prejudices?” Parts of an autobiographical post appear in the introduction. Indeed, I gave an earlier, article version of the title chapter its own blog post. Scattered here and there across the blog are glimpses of me thinking about racism in children’s literature. Many of these pieces will vanish when the blog does, but others — almost always in a significantly revised form — find their way into the book. So, a hearty thanks to those who have read and commented here, answered my questions, offered feedback when I’ve presented portions of this work, or educated me via your books and articles. I’ve learned so much from all of you. (Hint: Look for your names in the book’s Acknowledgments!) I couldn’t have done it without you. Thank you. This is not the title of the talk that Christopher Myers gave here on Thursday. 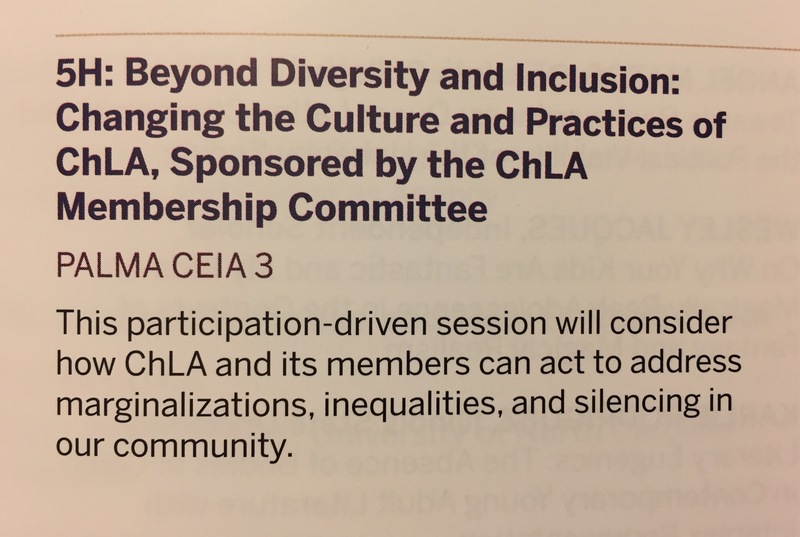 It was called “Please Don’t Agree with Me: the Need for Disagreement in Debates About Literature for Young People.” However, I’ve aligned these three words — disagreement, difference, diversity — in my title because one of Myers’s central points is that respectful, thoughtful disagreement respects difference, and that this respect makes diversity (in its various forms) possible. As he says, “the most disturbing” argument is that “difference doesn’t really exist.” Contrary to this claim of absence, “Difference is real. The narrative that we are all the same underneath is a fear of difference.” I like this idea because we so often hear the “we are all the same” narrative — offered, often, with the very best of intentions, affirming our shared humanity, encouraging us to see past any differences to build upon what we have in common. While these points of intersection can provide moments of connection, if we really wish to understand another person, we need to get to know their different life experiences. Or, to put this another way, we also have difference in common. Though Myers did not invoke color-blindness (in a racial sense), the “difference doesn’t really exist” way of thinking exemplifies what Eduardo Bonilla-Silva calls color-blind racism, a refusal to acknowledge difference that serves as a kind of “ideological armor for a covert and institutionalized system in the post-Civil Rights era. And the beauty of this new ideology is that it aids in the maintenance of white privilege without fanfare, without naming those who it subjects and those who it rewards” (3-4). 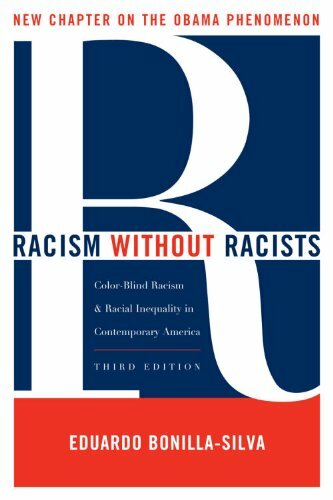 As Bonilla-Silva argues, via such color-blind racism, whites can “enunciate positions that safeguard their racial interests without sounding ‘racist.’ Shielded by color blindness, whites can express resentment toward minorities; criticize their morality, values, and work ethic; and even claim to be the victims of ‘reverse racism’” (4). Color-blindness is a myth, and anyone who tells you “I don’t see race” (though they may mean well) is lying to you, or to themselves, or both. We all see race. But racial difference need not be an impediment to understanding, or to friendship, or to love. We have difference in common. Myers did not take his own argument in that precise direction. Or, perhaps, he deliberately preferred to imply that argument rather than state it directly. (Note to Christopher Myers: should you happen upon this and find that I am misrepresenting your claims, please clarify, debate, rebut, etc. in the comments below. Thank you!) Myers instead focused on literature and on learning, noting that, via children’s and YA literature, “we give frameworks for thinking about difference.” He did a wonderful job of contextualizing this argument within canonical works, mentioning (for instance) that Lewis Carroll’s “Jabberwocky” is a narrative of difference. I particularly loved his point that agreement can efface difference, whereas “Disagreement recognizes an actual difference.” As he said, “The narrative of I really, really care” — about diverse books, or about the need to secure human rights for Black citizens of the U.S. — “is really stressing me out right now.” The reason it was stressing him out is that if everyone did indeed really really care, these problems would not be problems. As he put it, “The problem wouldn’t exist if we all agreed that these things shouldn’t happen.” Exactly. 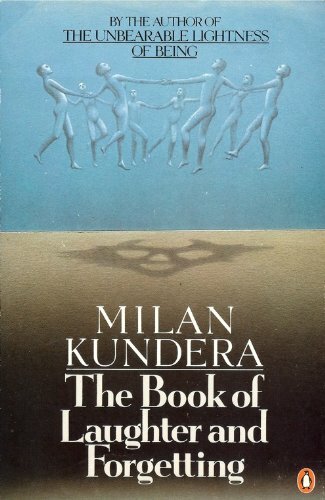 Saving Kundera’s gender politics for another day (or, perhaps, for the comments, below), Kundera’s “That’s just like me, I . . .” resonates with what Myers was saying. Agreement effaces difference. If we really listen to other people, we hear the differences as well as the commonalities, and we do not try to impose our narrative upon theirs. “That’s just like me, I . . .” is attack disguised as sympathetic engagement. In contrast, disagreement is a great way to talk about and to respect difference. And I do not mean that we always “agree to disagree”: that can be a valuable approach, of course, but some disagreements are so profound that simply “agreeing to disagree” becomes a way of papering over the depth of disagreement. I mean, instead, that respectful disagreement can be a path to better understanding — of both the other person’s position and your own position, which is another point that Myers made. Here is another: “Real disagreement is also real connection.” Yes. Myers himself, by the way, is an excellent speaker — remarkably, he delivers a fluent talk without any notes — and knows a lot about an array of subjects, from art to filmmaking, to censorship, to design. You probably know him for his children’s books, and for essays like “Young Dreamers” and “The Apartheid of Children’s Literature” — and he’s eloquent on these subjects. If you don’t know these pieces or his other work, his curiosity, intellect, and versatility make him an artist whose work you should get to know, whether or not you agree. Thoughts? Disagreements? Use the comments below. Thanks.